THE RENSSELYRICS SEEK removal of probation status. The Rensselyrics were taken off of probation on Thursday January 31 2019. In September, the Executive Board places the a cappella group on probation for violating Union procedures; it had spent around $3,300 on recording a CD without a purchase order. As a result of the probation, the recorded music files were withheld from the club and all of its members were required to attend financial workshops, meet with their SARP and Executive Board representative, and attend weekly Executive Board meetings. Union Club Operations Committee Chairperson Caitlin Kennedy ’19 explained the original rationale for the club attending the weekly meetings, saying that they could learn about how the Executive Board works, although she then qualified her statement and said, “I don’t know if I’d use it again.” The motion to “[reinstate] the club to good standing” and “release Rensselyrics music files to the club members” passed 14-0-0. The other club to come before the Executive Board on Thursday was the competitive, creative problem-solving club, Destination Imagination. It requested a subsidy for travel to the 2019 Global Finals Competition. For the past decade the competition has been in Tennessee, and the members have driven to and from the competition. This year the event is in Kansas City, Missouri, and the entry fee has been changed from $750 a member to a flat rate of $5,500 per team. Additional costs include hotels for stops on the drive there, as well as an AirBnB rental once in Kansas City, since it’s cheaper than a hotel. Vice President of the Union Anissa Choiniere ’20 expressed concern about the Union allowing people to stay in an AirBnB rental, but Business Administrator Martha McElligott explained it was acceptable, due to it being fully insured. 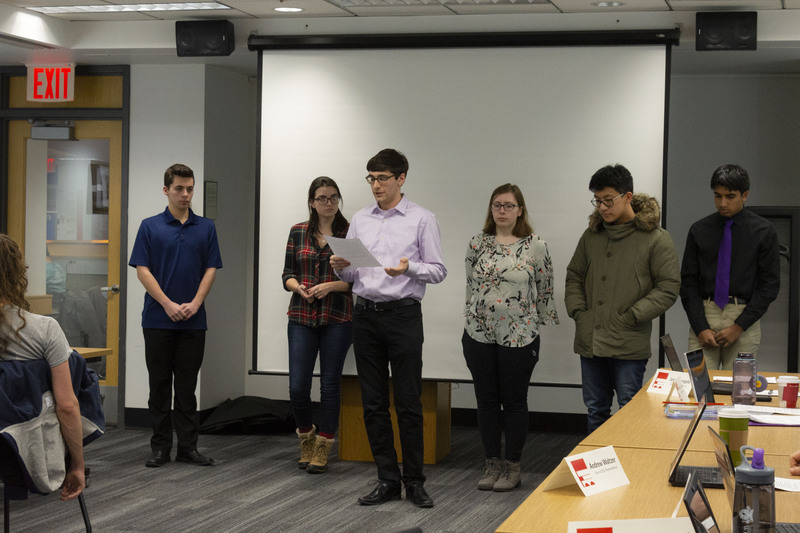 Business Operations Committee Chairperson Brian Mansaku ’20 expressed concern about the cost of the competition considering that anyone can enter without qualifying for it; he then countered his own point saying that there is leftover money in the fund that should be used. The motion to “approve the reallocation of $3334.80 from FY19 Travel Contingencies” for the competition passed 13-0-1. Union Marketing, Advertising, and Publicity Committee Chairperson Alex Schneiderman ’19 presented a new homepage for the Union website. Features included an “about us page,” a new minimal layout, a Twitter and Instagram block, a calendar, and feed of events. Graduate Representative John Jacangelo recommended adding a Google Calendar integration. Kennedy recommended putting the Instagram block above the Twitter block due to Instagram being more popular. Kennedy found out she would be graduating a semester earlier than planned, leading to a motion to approve “the appointment of Caitlin Kennedy ’19 ’20 G to the position of Class of 2019 Representative” that passed 13-0-1. This was a reallocation in Board member positions—Kennedy from member-at-large representative to her current title—that opened up a voting position for Multicultural Leadership Council Chairperson Dragana Dragutinovic ’20. A motion to approve Dragutinovic to the position of member-at-large representative, upon Senate confirmation, passed unanimously.